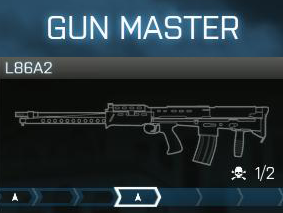 The Close Quarters DLC for Battlefield 3 introduces a new game mode: Gun Master. This mode is similar to the “Gun Game” mode introduced as a mod to Counter-Strike. Here I will explain the game mode, then go into tips and strategy. How does the Gun Master mode work? All players are locked into using a single weapon. Everyone begins with a pistol and must get kills to advance to the next level. When a new level is reached, a new gun is equipped. There are a total of 17 levels – the first player to complete the 17th level wins, ending the round. Dying does not cause you to lose your progress. Ammo is unlimited, but guns must be reloaded as usual. Specializations, such as SPRNT, are unavailable in Gun Master. Weapon attachments are set by the game mode and cannot be changed. You’re equipped with a knife at all times, but getting a kill will only advance your own rank if you’re on the final level (17). Killing a player with the knife instead of your main weapon with demote them to the previous level. Levels 1-15 require two kills each. Levels 16 and 17 (the M320 LVG and Knife) require one kill each. This is a team-based mode; players are split between two sides. All teammates of the winning player are also credited with a victory. You can earn points (XP) toward your next level, weapon unlocks, assignments, and ribbons/medals in the Gun Master mode. However, no points toward classes are given as you’re not allowed to select a class. You can see your current level and kills towards the next level just above the minimap in the bottom left corner, as shown below. The progress bar, shown below, tells you what level you’re on compared to all the other players. Your level is the one highlighted with a white box. This can be seen either when dead, or at the bottom of the screen while alive. 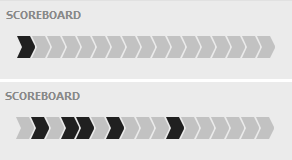 Battlelog shows the progress bar under the scoreboard. You’ll have the best shot of winning if you join at the start of the round (as in the upper part of the image below). As another option, you can join near the end of the round and wait a short while for the next round to begin. Set your spawn to “auto-deploy” and start moving as soon as you’re ready. Always seek out enemies to shoot. You won’t kill enough enemies to keep the lead if you stay in one place. Put your minimap to use. Set the zoom level to medium for a full view of the map. Whenever you don’t have a target, look at the minimap for locations of enemies who have fired their weapons and chase after them. Listen for gunfire and watch for dead teammates. This can help you track enemies, even when they’re on different floors of the map and don’t appear on your minimap. Master the pistols. If you can progress to PDW’s while your enemies are stuck with pistols, you’ll have a big advantage. The MK3A1 shotgun (level 7) has Frag Rounds equipped – you may find that shooting through cover and at your enemies’ feet is more effective than trying to get direct hits. The JNG-90 (level 15) is a bolt-action rifle with a very slow fire rate. It’s possible to get kills by setting up at the end of a long hallway and waiting for enemies, but that often isn’t the fastest way as it relies on wounded enemies, headshots, or multiple hits. Since the JNG-90 is equipped with a laser sight, it’s fairly accurate firing from the hip. At short range, it will kill an enemy with full health. Practice running around and hip firing the JNG-90 at your enemy, aiming center mass, for fast kills. The M320 LVG (level 16) is probably the most difficult weapon to get a kill with. The grenade will only explode after its 2-second timer runs out, much like a hand grenade. This means enemies will often run away from it. Fortunately, you only need 1 kill with it to progress. You have unlimited ammo, so fire often. Watch the minimap for groups of enemies to shoot at. Since they appear on the minimap, these enemies are often in a firefight and may be wounded. The larger the group of enemies, the better your chances that one will get caught in the explosion. The knife (level 17) requires only 1 kill. Knife takedowns from the back can be tricky with this fast-paced mode. If you encounter an enemy who sees you, it’s possible to kill them by slashing them from the front. If they were already wounded by another player, 1 slash may be enough to get a kill and win the game. I have BF3 on PS3. I know you can set the mini-map at different zoom levels on PC, can you do that for PS3 too? Also can I set my spawn to “auto-deploy” on PS3? Unfortunately, these are both features of only the PC version and aren’t available on PS3 or Xbox 360.